With a privileged location on Via Veneto, next door to the Villa Borghese gardens and the historic Roman walls, the Rome Marriott Grand Hotel Flora is an ideal base for your vacation. 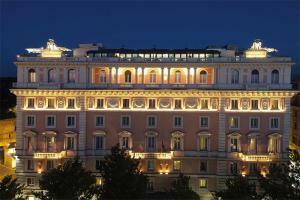 The hotel's stylish décor captures the grandeur of Neoclassicism, offering refined luxury and timeless elegance. Well-appointed rooms and suites offer a restful retreat. Enjoy a restorative dip in the hot tub within the hotel's solarium, or feast on Mediterranean cuisine at the Flora Restaurant. The Flora Roof Top Terrace is the perfect setting for wedding receptions and celebrations, or to admire enchanting views of the city. Ciampino Airport is 17 miles from the hotel, and Leonardo da Vinci International Airport is 20 miles away.